Thank them with fabulous, delicious, mind-bendingly good food. Great gifts of food for new hires, anniversaries and other big events. Stand out from the pack when you send food that really tastes great. From 1 gift to 1,000 we specialize in gifts that really taste great. for each of your recipients. We can include your logo, stationery or company merchandise with your gifts. Your personal concierge is standing by. We take care of all the details and data entry. How do I order gifts for multiple recipients? 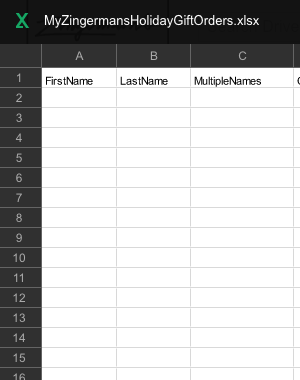 The simplest way is to download our Excel template here. It’s self explanatory and you can fill it out at your leisure. Email it back to us and we’re off to the races. Or just give us a ring and we can take your order on the phone. What happens after I send you my order? You will get a confirmation receipt right away. We’ll go to work entering the order, checking the addresses on our address verification software and, if the order is large, checking that we can bake and make everything you need. For most orders this is all done the same day you send the order in. When you want it to. Most of the time we can ship same day until 5pm ET. (I say most because with large orders with many recipients sometimes we have to wait a bit to bake, make or buy the foods you need.) We also specialize in shipping when you want to arrive when you want. You can place orders now that won’t arrive for weeks. When you want it to. We can send most gifts to arrive any weekday and we can get very close to—or exactly on—the date you need it to arrive depending on the method of shipping. How will I know my order has been delivered? We will email you tracking numbers for every gift. You can track your order all the way through the process. Or we can happily do it for you and let you know the results if tracking dozens of packages is not the way you’d like to spend your afternoon. Sorry, not with Zingerman’s. We can send food to all 50 states. Unfortunately, we can't send Zingerman's internationally. We'll be happy to help you find someone who does. Email bizgifts@zingermans.com or call 866.260.6169. Yes, absolutely! We have customizable gifts that you can order online. For all other customizations we’ll need to chat or email so we can make sure what you’d like to send can fit in the gift boxes, gift baskets and wooden crates that we have. Call us at 866.260.6169 or email us at bizgifts@zingermans.com. Can I add a logo to my order? Yes. There are lots of different ways we can do it. To see some check out our catalog here or call us at 866.260.6169. What file specs do you need for the logo? You can send .jpg (.jpeg), .png or .bmp. If it’s branded on a wooden crate send 600 dpi. If it’s on a gift note 300 dpi. Where do I send the items for my custom order? The Sour Cream Coffee Cake. It's our classic, the top selling gift for over two decades. Baked by us, loved by all. Runner up is the Weekender Gift Box. It includes a wide array of goodies (bread, brownies, peanuts - just to name a few) that will keep the recipient munching well after it's received! Yes. We’re happy to set up terms for your company, too. 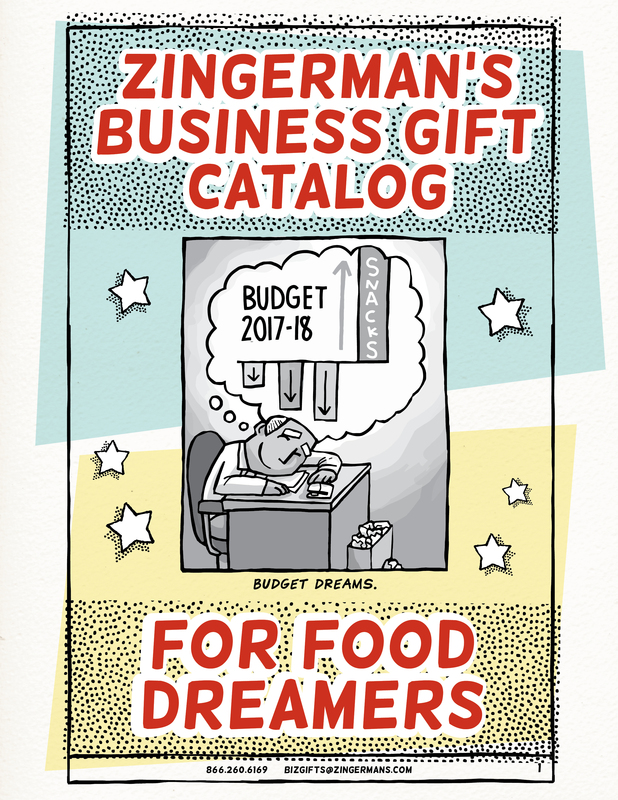 Email us at bizgifts@zingermans.com and we will send you all the documents you need to get the ball rolling. Answers usually come in 4-6 days about 1 hour.